Download "MVC FRAMEWORK MOCK TEST MVC FRAMEWORK MOCK TEST I"
1 MVC FRAMEWORK MOCK TEST Copyright tutorialspoint.com This section presents you various set of Mock Tests related to MVC Framework Framework. You can download these sample mock tests at your local machine and solve offline at your convenience. 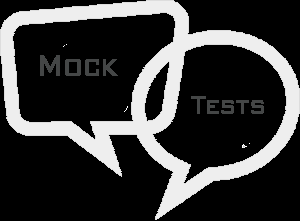 Every mock test is supplied with a mock test key to let you verify the final score and grade yourself. MVC FRAMEWORK MOCK TEST I Q 1 - You are designing an application in which a section of the main page will be populated by content from a third-party provider. You do not have control over the responsiveness of the client or how much information will be returned with each request. The call is to a Restful service and will return the information formatted in Extensible Markup Language XML. What is the best way to implement this application? A - Design a model that handles the data call to populate the model. Create a partial view containing only this display area and put an asynchronous service call that returns this model in the partial view controller. B - Put a synchronous service call into the main page controller. C - Create a partial view containing only this display area and put a synchronous service call in the partial view controller. D - Create a partial view containing only this display area and put an asynchronous service call in the partial view controller. Q 2 - You have been given requirements for a dashboard page that will contain summary information from your order processing system in a single display table. However, this summarization needs to be done by combining data requests from the order system, the shipping system, and the accounting system. The dashboard page will be the only place you use this combined data. What is the best way to implement this requirement? A - Make the various data requests and compile the information in the controller for display. B - Create an individual model for each of the data requests, and then create a view- specific model that calls those models and merges the data. C - Create a model for the summary data and handle the various data requests within that model as well as the merging of the data. 3 new services using WCF. B - Use the Web API to create REST services using ApiController in which the serialization type is defined by the Accepts property of the browser. C - Build a basic ASP.NET MVC 4 project in which the view simply passes through the information provided by the controller, and the controller manages the code for serializing the response. D - Create an ASP.NET ASMX services file to get, serialize, and return the data. E - B,C and D Q 6 - How could you traditionally consume an ASMX web service from your application? A - Generate a proxy by selecting Add Reference in Visual Studio. B - Create an HttpService and connect using Get URL. C - Generate a proxy by selecting Add a Service Reference in Visual Studio. D - Create a WCF proxy class. E - B and C both. Q 7 - What are examples of hybrid applications using Windows Azure? A - An application where the local network hosts the IIS server while the database is being run from the corporate IT office B - An application where Windows Azure is used to host the IIS process, and Windows Azure SQL is used to store the data C - An application where the IIS process is run on a local web server, whereas the data is stored in Windows Azure SQL D - An application where the web part of the application is run on Windows Azure, whereas the confidential data is stored in the company's network Q 8 - What occurs if an unhandled error is fired on a startup task? A - The startup role consumes the error during its load; if there is no event handler configured, it is set to Handled as the task completes. B - The startup is cancelled and the role does not start. C - The OnStop method automatically runs. D - The startup task goes to the lowest security setting and continues to run, if possible. 5 Q 13 - As you design a session-less state management system, what do you need to ensure that your application manages? A - Access to the state management system, whether it is a database, a web service, or other type of system B - The HTTP headers C - The session setting within the Web.config file D - An identifier used by the server to identify the request Q 14 - You are designing a work order management application for a mid-size repair company. The application will be used by repair personnel in the field on their laptops with wireless phone connections. The connections are slow, and the laptops are several years out of date. There will never be more than 15 users at any one time, and rarely more than 2 concurrent users. What kind of caching will give the repair personnel a better user experience? A - Page output caching B - Application caching C - Data caching D - HTTP caching Q 15 - You are creating a solution in which the majority of the application is dynamic, but some areas can be cached for a long time. What kind of approach would you take? A - Data caching B - Donut hole caching C - Donut caching D - Windows AppFabric caching E - B and C both Q 16 - You are adding a reporting vertical to an enterprise application. Many of the reports will be run every morning by a set of users. Some of the reports will be identical as every member of a team will get the same report sometime in the morning. What kind of caching will provide an improvement in performance? 6 A - Data caching B - Page output caching with duration of two minutes C - Page output caching with duration of four hours D - Windows AppFabric caching E - A, C and D Q 17 - What is the technique in which the client sends a request to the server, and the server holds the response until it either times out or has information to send to the client is? A - HTTP polling B - HTTP long polling C - WebSockets D - HTTP request-response Q 18 - You are building an application in which you want to display updated information to a website every 15 minutes. What are efficient ways to manage the update? A - WebSockets B - HTTP polling with 1-minute intervals C - HTTP long polling D - HTTP polling with 15-minute intervals Q 19 - What is the first request sent to start HTTP polling? A - HTTP DELETE B - HTTP GET C - HTTP CONNECT D - Upgrade request Q 20 - In an HTTP module, can you redirect the request to a different handler than is in the routing table? If so, what event would you handle? This course provides students with the knowledge and skills to develop ASP.NET MVC 4 web applications. Server Deployment and Configuration. Qlik Sense 1.1 Copyright 1993-2015 QlikTech International AB. All rights reserved.